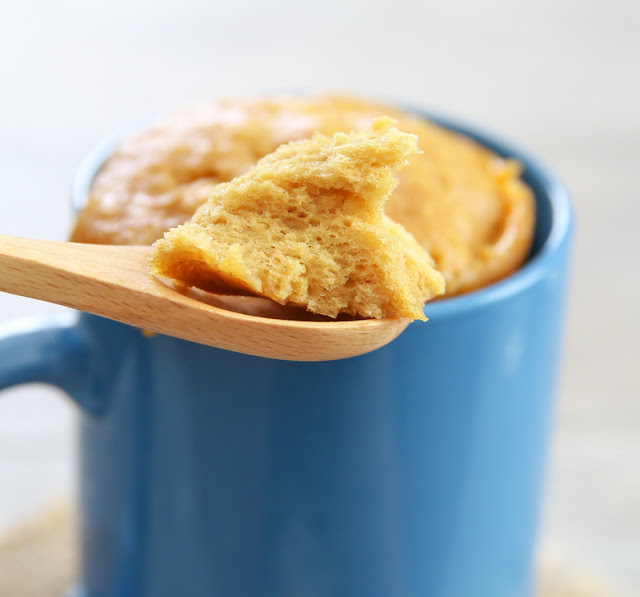 This easy flourless gluten free peanut butter mug cake is only three ingredients. It cooks in the microwave and is ready in about 5 minutes. 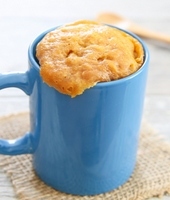 Just like how easy this mug cake is, I’m going to keep this post simple and sweet. I’m quite tired. In the past 2 weeks, I’ve traveled out of town three times. And while I’m grateful for all the experiences, I’m also exhausted. I’m looking forward to being in my own home for an extended period of time and going back to my normal routine and back to my regular blogging schedule. But even in my exhausted state, I can make this five minute mug cake. And you can too. 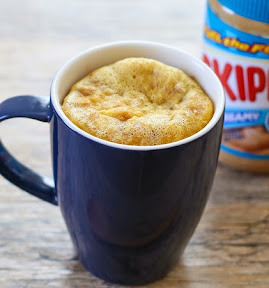 I actually already have a flourless peanut butter mug cake recipe I really love. But I was playing around in the kitchen the other day and discovered I could create one with just three ingredients. This cake is peanut buttery, but also light and fluffy. You won’t believe it’s flourless. If you have peanut butter, eggs, and sugar, I urge you to try it now. Recipe updated with a new video! You can find all my recipe videos on my youtube channel as well. 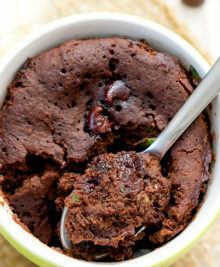 If you enjoy this recipe, be sure to check out my cookbook* of nearly 100 mug cakes! 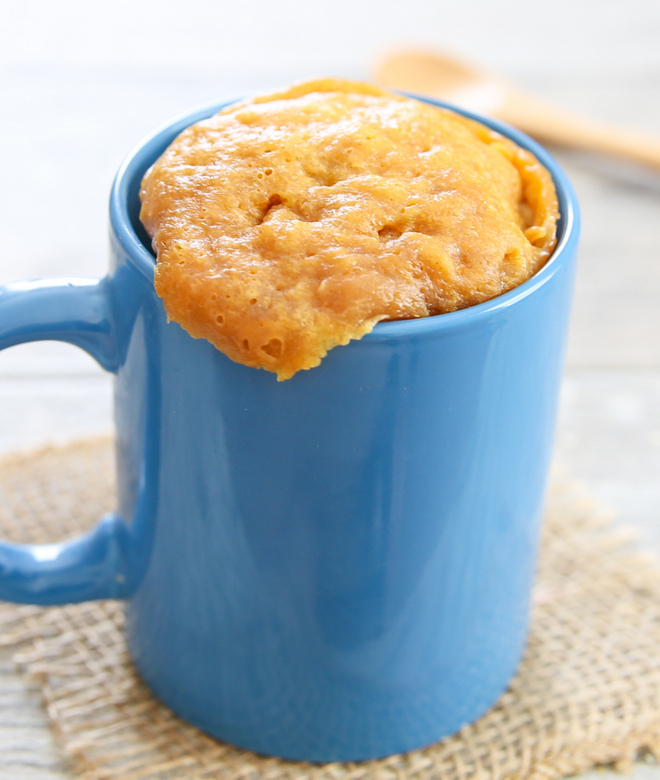 This easy flourless gluten-free peanut butter mug cake is only three ingredients. It cooks in the microwave and is ready in about 5 minutes. Whisk all ingredients into an oversized, microwave-safe mug until batter is smooth and egg is fully whisked in. Microwave for about 1 minute. Let cake cool a few minutes before eating. I made this for the first time tonight and it was just amazing! I haven’t been able to have good cake for almost two years now thanks to a diagnosis of gluten intolerance (probable celiac, waiting on further testing) and this was just fantastic. Everything cake should be without the hassle! Thank you so much for posting it! thank you! you’re comment just made my day! I just made it and substituted the sugar wit a teaspoon of Stevie. Your recipe is really awesome! Thank you for sharing! Ok is it just me or did i do something wrong ? The texture was very rubbery ? it definitely shouldn’t be rubbery! Did you change or swap out any of the ingredients or ingredient amounts? One thing, make sure you really get all that peanut butter off your measuring spoon and into the cup because it makes a huge difference. Does anyone know how many carbs in this amazing mug cake? This recipe was so delicious. I substituted the sugar for Stevia and it was amazing! I just made this and ate it. Delish! Spread a little cream cheese icing I had left over from a different dessert. .OMG so good! Still unbelievable how it came out like a cake and in the microwave! Look forward to trying your other recipes. Thanks for sharing???? Hi I know it’s 2017 but I still want to say an few things. I haven’t tried this recipe yet hit I read the comments and people said its good. I appreciate you making it gluten free and healthy. I am so glad to try out this recipe and sorry that I made this reply late. I look forward to you making more of these microwavable peanut butter cookies. If you have please show me the website or tell me the ingredients because I am so eager to try it. Thank you again and thanks for reading this comment. You are an great and wonderful person. Continue being amazing. Can’t believe it made cake! thank you. and gluten free too! yummy ! I’m going to try some of your other recipes too! I’m glad you enjoyed! Yes, please check out my other recipes too! have not tried because don’t know how many calories? thanks for doing the calculations! 151 calories to your 405. It tastes real good. I thought it was too good to be true! Then I tried it!! Yummy! I made this with almond butter and coconut sugar and it was delicious! And so simple to make! nice! i’m glad it worked out for you! This cake is amazing!! Thank you so much! I made this last night with a little Nutella added in and it was just beautiful <3 Definitely one of the best mug cakes I've come across, texture and taste-wise. Easy to make and really delicious! I love peanut butter, so this will be my go-to treat. I added 1 tsp honey and it turns out great, but I should have not added M&M, that’s quite silly and useless. Would it work with artificial sweetener instead of sugar ? I think so but I haven’t tried it. I just ate my first mug cake! I am a diabetic, so I made it with 2 tsps. sugar, and 2 tsps. Stevia. I really enjoyed it! im so glad you enjoyed it! This turned out amazingly good. I used honey instead of sugar and I added some chopped walnuts. I can’t believe it worked! It was delicious.I I used crunchy peanut butter and a packet of sugar substitute! Thanks for sharing this recipe! haha, i love hearing people say this! yeah it is unbelievable but it totally works. glad you enjoyed it! do you need to grease the mug? nope! it’ll pull away from the sides when it’s cooking. ooh what a good idea! Can you use pure cane sugar instead of granulated sugar? I made this last night because I was craving peanut butter. I was very disappointed with the result. It looked just like an egg with peanut butter. I tried it and it wasn’t horrible but it was totally not what I was going for. I don’t think I mixed the ingredients as much as I needed to. I am going to try to mix it outside of my mug then pouring it in and seeing if that works. Super excited to try again! Hmm, it definitely should not look like egg and peanut butter. The ingredients should be mixed until it’s one uniform smooth light brown batter and it’ll look like cake batter when you’re done whisking. wow im so impressed with this recipe, but shouldn’t it have liquid or something like milk in it to help with the mixing? i’m surprised it works so well! I tried it for the first time after seeing it on Pinterest and it’s just such an easy recipe and tasted delicious!???? I love this recipe! I’ve made this about 4 times. One of my coworkers added a scoop of protein powder to this and used almond milk to thin out the batter. It turned out really well, but it was dense and filling…especially right after he polished off your original recipe. I look forward to trying your other recipes to spice up healthy weeknight dinners. Thank you for all the great content you post on your blog! Thanks for taking the time to leave such a kind comment! I’m glad you are enjoying this recipe and the protein powder sounds interesting. I’ve heard other people doing that with this one but I haven’t tried it myself. This looks amazing – but I don’t cook with a microwave. It probably wouldn’t work in an oven, would it…? What do you think? Yum! Just made this and topped with a big scoop of butterfinger ice cream! Delicious and oh so fast and easy!!! I want this with my lunch so bad, but I have no eggs or baking powder in my house (apparently we ran out). 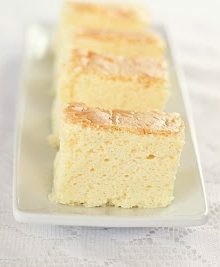 Is there any way I could make this with just cartoned egg whites? Ohhhhhhhhh …. This super easy and super YUMMAY!!!!!!! Hi I just tried this using sweetner for diabetics instead of sugar and it worked wonderfully! ty !! Just tried this! Used two tablespoons of almond butter and 1 table spoon of Skippy Reduced Fat also used egg whites only. Would of probably tasted slightly better with all Skippys (the almond butter was no salt) but I tried to take a slight step towards health haha! Put a few dark chocolate chips in the batter and it was delicious! Thank you for sharing! Best mug cake I have tried so far! I clearly did something wrong. While still tasty, not great. I will try again though to see if I did something wrong. I am the type who can burn water. hmm did you make sure to whisk until the batter is smooth? you don’t want the egg and pb to still be separate or have streaks. Oh my god, this is amazing! I used crunchy peanut butter because I didn’t have any creamy peanut butter, which turned out to be delicious! The soft cake mixed with the crunchy peanuts tasted out of this world! Lovin’ your recipes, can’t wait to make more! that’s so great to hear! hope you try all the mug cakes! I just made another batch of peanut butter cake but I realised that it was dinner time and I already had noodles ready for dinner. Should I leave the batter in the fridge or microwave it now and let it cool for tomorrow? if it looks like an egg then you didn’t mix the batter enough. you have to completely whisk the batter until everything is fully incorporated with zero egg streaks. Make sure you have a good whisk. If you are using a fork or some other tool, it’s going to be a lot harder to beat the batter by hand. Before I make this? Does it work with natural peanut butter. I know they tend to be different. If not, I shall run out and buy creamy pb! Thank you! Maybe I’ll just get the creamy so I don’t mess up! I loved this! I was hungry after school one day and I made this. Yummy! This “cake” is truly one of the best things I have found to satisfy a sugar craving while on a strict low carbohydrate/high protein/no processed sugar diet. It’s so good that after eating you’ll probably try to convince yourself to feel guilty about cheating after eating it! I used no calorie Stevia sweetener in mine and it turned out perfect. A little tweak on this recipe, use it as a base to make microwave cookies too! Same exact ingredients, just add enough rolled oats to the original recipe to make the mixture the consistency of cookie dough–about 9 plastic spoonfuls here in my dorm. 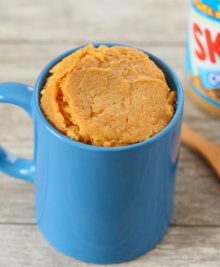 Instead of putting the dough in a mug, dollop cookie sized spoonfuls on a paper plate and “bake” in the microwave around 1:30 on high. I usually go about 2 minutes, but my microwave is old and slow. Thank you so much for this recipe. It’s been a lifesaver for me! What a great idea. Just made it and it tastes great. I might try adding chocolate chips next time or even peanut butter chips too. Wow! I made this with two Purevia packets (may add one more next time). In the meantime, I added a little chocolate syrup which was excellent. Even though it’s called a cake, it is the perfect protein breakfast my son needs before school. To think I will let him eat cake for breakfast. Thanks for sharing this. This is fabulous! The first time I made it, it was a little denser than I had hoped. I did use Splenda instead of sugar though, so maybe that changed the texture. The next time, I tried adding 1/2 tsp of baking soda and that worked great! Much fluffier and cake-like. It’s great with a small bit of chocolate chips on top after too! i’d suggest adding baking powder if you want more fluff. My original one had 1/4 tsp baking powder. This one eliminates the baking powder- it’s not quite as fluffy but I thought it was still really good. You’ve changed our lives. My 14 year old has celiac, and we always felt terrible having birthday cakes and other gluten desserts even though she is a good sport about it. The solution was just three ingredients and two minutes away. Thank you thank you thank you!! This looks amazing; i can’t wait to try it! Just curious, which recipe comes out more fluffy, the one with baking powder or without? I would think the baking powder would make it more fluffy, but judging by the photos this one looks more fluffy. Also, do you have a favorite? I’m anxious to try this with my boyfriend. He Loves everything peanut butter! the baking powder one is def more fluffy and I prefer it slightly more. but this is a good quick fix if you don’t have baking powder on hand and it has a little bit stronger pb flavor. I’d say make on of each! I’m sorry you didn’t like it, but it sounds like yours didn’t come out the way it is supposed to. if it tastes like scrambled eggs it sounds like you didn’t whisk the batter enough. The batter needs to be completely uniform and it’s best to use a good whisk. if the egg isn’t completely mixed with the batter, then it just becomes cooked egg rather than cake. I went into this with the mindset that Im gonna prove this lady wrong, these three ingredients can’t ever make something even resembling a cake, and so to my, utterly delightful surprise, it came out as a delicious peanut buttery, moist cup of heaven cake that surpassed my expectations completely!! I added some fresh slices of banana on top – perfect guilt free dessert!! Fantastic recipe, I am very impressed!! Ps. Please may I share this recipe on my blog? Its a keeper! Haha! I’m so glad you enjoyed it. I would request that you please do not share the full recipe on your blog and instead link to my post for the full recipe. thank you! I made this last night, and oh my goodness!!! THIS WAS HEAVENLY! I’m no nutritionist but I have had several people tell me they eat it for breakfast! I tied making it in a cupcake paper, attempting to make a presentable dessert for others, however, there is alot of air bubbles in the cake. Do u know why? Are there a lot of air bubbles in the batter before you put it in the microwave? If so, then you should let those bubbles settle/break before you cook it. If you do have a lot of bubbles in your batter, it might be a sign of mixing too hard or too much. good luck! Just made this! It cured my sweet tooth. I also made a cream cheese “icing” so go on top with 1 tbsp. of cream cheese and 1 packet of splenda mixed together. This is ok but kinda makes me think think of peanut butter flavored scrambled egg. Works beautifully with Stevia! This is my new favourite way to enjoy peanut butter. I just made this mug cake with some adjustments. I only used 1 tbsp sugar and added dark chocolate chips because I love chocolate & peanut butter together. It came out great! I have a child who has a severe peanut and tree nut allergy. So I substituted SunButter (Natural) for the peanut butter, and this turned out amazing! Thank you for providing such a fun and delicious recipe! wow, so glad to know that it works! i know quite a few people with peanut allergies so this is good to know. I just made this and the cake seems dense and tastes eggy. Maybe I didn’t mix the ing rodents enough. you definitely need to make sure to thoroughly whisk the ingredients so it becomes a very smooth batter, just like any other kind of cake. hope that helps! Wow! Finally! 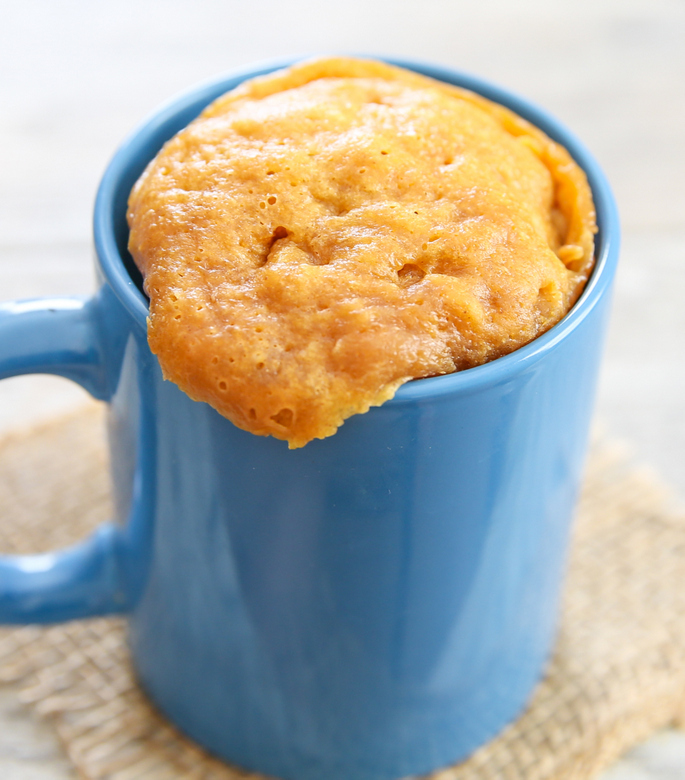 A mug cake recipe that works flawlessly! Thank you! I have tried so many and failed at every one. Also great is that it’s three ingredients I always have at home unlike some chocolate mug cake recipes that call for special cocoa powder and such. =) =) I’m so thrilled to hear you enjoyed this! I just tried this and was disappointed, i did everything correctly, but it barely has any taste and i just feel like i’s eating idk what. Will attempt again with more sugar and see if i prefer it that way but i really like the Idea none the less. will still pass on to others. maybe try adding something on top like chocolate syrup? This is an excellent quick fix for a sweet tooth that I don’t feel quilts about! I added mini chocolate chips, which was phenomenal, but after reading the comments I’m wondering about adding blueberries to it for a PB&J-type breakfast. Thanks for sharing. And, btw, you are very patient to continually tell people that they need to stir the batter up completely. Seems kind of obvious to me. ???? So glad you enjoyed it! Hmm, love the idea of blueberries! All I have at home is whipped peanut butter, would that work as well? Sorry I’ve never worked with whipped peanut butter before! So easy! So good! Used honey instead of sugar and tossed in some mini chocolate chips..yum! OMG! this is amazing! I made mine with Agave and it worked great! Had to use a soup bowl b/c we don’t have mugs, so I had to cook it a little longer. but none the less, thank you! this will help with my sweet cravings! This is BY FAR the best mug anything (cake, cookie, brownie, etc.) I’ve ever had! I was skeptical at first not sure about the batter but it turned out great and tasted good???? I tried this after reading the many rave reviews on how “amazing” and “awesome” and “soooo good” it was and I honestly wasn’t all that impressed. It wasnt terrible but it certainly didn’t live up to all the hype and rave everyone else was giving…. I did it exactly to the recipe and directions and the only thing that made it good enough to eat was a lot of ice cream scooped on top. Would probably not fix again. everyone has different tastes. sorry you didn’t love it! I don’t think it’s the most amazing thing ever, but for something that only takes three ingredients and less than five minutes, I think it’s pretty good! This cake is very good. It is perfect for someone who has to have good protein in their diet. Now I have found one more desert I can have. Thank you. I have hypoglycemia. This is good for me. You’re right! I can’t believe there is no flour in there. Tasty treat that has ingredients that are always in my house. I bet adding chocolate chips would be amazing! Thanks so much for this simple, delicious idea! I love the idea of adding choc chips! I was very skeptical, I can’t believe how amazing this is! Just saved me from going out and eating half my weight in ice cream, haha. Just tried this as a break from studies and it doesn’t really have a cakey texture but oh god oh god oh god the taste is so mindblowingly fantastic…out of all the mug cakes I’ve tried, this is the probably the second or third that I’d love to try again! I just found this recipe and am going to try it this weekend! From comments, this sounds like it comes out a bit like a souffle. Mmmm. C’est vraiment bon et très simple à faire ???????????? This recipe is a total game changer for me! I love low carb diets but the real struggle for me comes at night when I want something sweet, like cake, for dessert. Often I give in to temptation and ruin a hard day’s work with sugar. I substituted 3 stevia packets instead of the sugar and HOLY COW!!!! Totally satisfied my craving while staying with my diet! Thank you thank you thank you for this!!!!! This looks delicious! Just out of curiosity, how many calories are there? Delicious! I’ve had many mug cakes, but not like this! I added some banana after I cooked it, super good! Hi. I made this cake and when I microwaved it, it had only risen about 1/3 of the way up the mug. The color was also a little darker than it was supposed to be. It was still good, but very dense. Do you know what I did wrong and how I can fix it? Maybe I overmixed the batter? I don’t think it is from overmixing the batter. What kind of peanut butter are you using? If you’re using a natural peanut butter that needs to be premixed, that could be an issue if it wasn’t completely mixed. Also the sugar can be the issue. If you used more sugar than what the recipe called for, the cake will be denser and won’t rise as high. Or if your peanut butter is already pre-sweetened that could also cause too much sugar in the batter. I am on a gluten free diet and have had an issue with finding simple delicious deserts. I tried your recipe and I love it!! 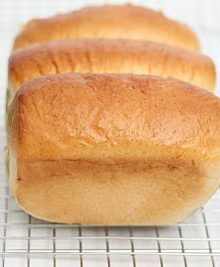 So moist and very good flavor, I added a little almond extract to it and it turned out amazing! Thank you so much! So I tried making it and failed, it tasts like a very sweet omlet with peanut butter. I did something wrong.???? Sorry to hear your first try wasn’t successful. Make sure you completely whisk the batter. It’s best to use a mini whisk, and really mix with some force, like you would any other cake batter. It should be completely smooth, uniform, like any other cake batter and no egg streaks. It sounds like your egg wasn’t completely mixed. If it is completely mixed in, then it won’t have an egg taste. Hi Kirbie! I made this today and it was awesome! I added chocolate syrup and stirred the batter just a tiny bit for a marbled effect. I microwaved it longer than one minute because it was still a bit moist. Turned out so delicious! Interesting how something so yummy only needed a few minutes? ???? Thank you for this recipe! Hey – Thank you for this super easy recipe that really satisfied my craving for something sweet and delicicous! I mixed in a bit of mashed bananas cos I didn’t have enough PB – and it totally worked! Thanks again! adding banana is a great solution. so glad you liked it! Wow, this was so simple and so good! 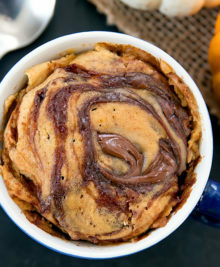 I was looking for low carb mug cake recipes on pinterest and came across this. I just replaced the sugar with my preferred sweetener. Nice and tasty! I wonder if I could add cocoa for chocolate taste. Honestly, this worked incredible! I really wanted cake but with no flour, and lack of a car I didn’t know what to do! Thank you so much!! Hey, how do I adjust it to high altitude? absolutely delicious and incredibly easy! oooh yum. love dark chocolate! I notice you have to pb mug cake recipes…which one would you say works best (I will also most likely omit the sugar)? so glad you liked it. love the banana addition! what would I do if I wanted to use honey instead of sugar ? Also, I heard that baking soda is good to use with honey, but you say to use baking powder. I do not have a microwave…. are there oven variations? Please and thank you. Was so very easy to make! Looked, smelled, and tasted delicious! I added a few pieces of dark chocolate to the top for a little extra sweetness. Found my new go to recipe. Thanks!! adding chocolate definitely is a great addition! so glad you enjoyed it! OMG! ! !Too good and too easy to be true u r amazing! !!!!! aww, so glad you liked it! This mug cake was delicious! It tasted just like a peanut butter cookie and I love that it was flourless! Made this tonight! I used Stevia in replacement of granulated white sugar , it was delicious !! CAN’T be 3 ingredients to satisfy your sweet cravings, while also being cautious of what you’re consuming! 🙂 thank you for this ! Can I use brown sugar instead of granulated white sugar? Well I’m not sure if anyone else has done so already but we are in the process of moving so my kitchen is practically packed and already at new house. Stupid move I know but you can make this in a mason jar if you don’t have a mug handy just have to microwave for 2 minutes and I’m assuming it’s bc the mouth of the jar is smaller than a mug. Delicious!!! I’m glad you found a solution! thanks for sharing! Just made this 5 mins ago…. Soooo yummmyyyy. Tried to make it and it was a gelatinous mess, even though I followed the recipe. I am not sure why other people are getting good results…I will have to try it again. Hi, did you make any substitutions or change any of the ingredients? Omg! This is delicious! I too swapped stevia for sugar. I drizzled chocolate syrup on top! Yummo!!!! Thank you for the recipe, loved it! Switched sugar for Truvia because my husband and I are on the keto diet and it was a great dessert! Will be making this again! I’m home sick and wanted a little comforting treat. This was perfect! So delicious and easy, thanks for the recipe! sorry to hear you are under the weather. i’m glad you enjoyed the recipe! Just made this with Swerve instead of sugar and added a tablespoon of Lily’s chocolate chips. Really good! So glad this worked out for you!